UK Stampin' Up! 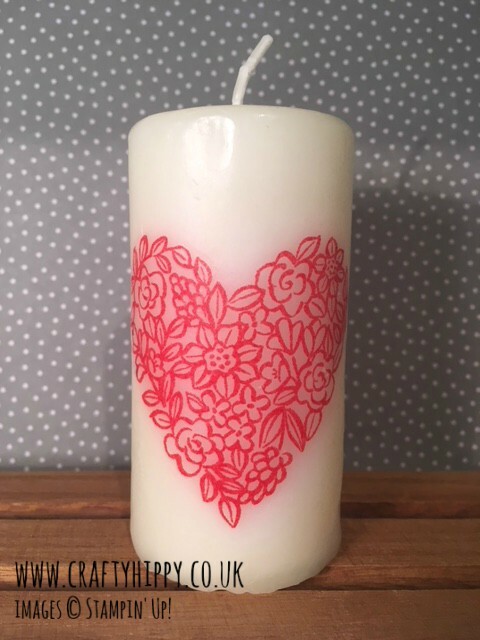 Demonstrator | make beautiful cards | Crafty Hippy: Simple Sunday: How to transfer a stamped image to a candle using the Heart Happiness Stamp Set by Stampin' Up! Simple Sunday: How to transfer a stamped image to a candle using the Heart Happiness Stamp Set by Stampin' Up! So this week has been very exciting with the launch of the new Spring Summer Occasions Catalogue and Sale-A-Bration. I've managed a little bit of crafting - I've not been particularly well but I managed to get at my desk for one afternoon which was pure heaven. I made some duplicates of this candle and a few cards which I will share with you over the next few days. This is a quick and easy craft project that is very simple and satisfying. You don't need very many supplies and full instructions can be found further down this page. This technique gives a professional result and is perfect for making gifts for friends and family. This candle looks remarkably like the one I made back in 2013. This one is smaller and has been created using the Heart Happiness Stamp Set, which is new to the Spring Summer Catalogue. 2013 - a very similar candle! Change colour or stamp for a different look. As I explained back in 2013, you only need a few things to create gorgeous candles - some tissue paper, greaseproof paper and a heat gun. And of course your stamps and ink. If you have any questions about this technique or the products I've used please don't hesitate to get in touch using the email address above, I'll only be too happy to help.